L.A.’s cake truffle, layer cake, cereal milk soft-serve and Crack Pie dreams come true at 11am this weekend, when the two-time James Beard Award winner opens the doors to her 15th Milk Bar location, the largest one yet. It’s a lot to take in, all gleaming steel and crisp white-and-pink décor, not to mention all of the shop’s concepts. There’s a retail side, where you can purchase Tosi’s signature cakes, pies, cookies and merch like enamel pins, totes and cookbooks. Snack on Milk Bar classics, as well as L.A.-exclusive items like the Pineapple Fo’ Sho Whip (Tosi’s take on the Dole Whip), which has remixed versions that turn the treat into a pineapple upside down cake “MilkQuake” (a thicker, frozen, spoonable dessert) ​or a coconut-pineapple shake. There are savory items for sale, too, including stuffed breads called “bombs”—pastrami and rye, pepperoni and cheese, and chorizo and egg, to name a few—plus elote cornbread bites. Thirsty? A full espresso bar awaits, and involves specialty lattes made with Milk Bar’s signature cereal milk. And for those who know what they want, that cutesy pink wall also includes a walk-up window for orders placed in advance. Of course throngs of curious and sweet-toothed Angelenos will be spending time indoors—especially for Tosi’s cooking classes. Tosi leads a birthday-cake cooking class in the new space. 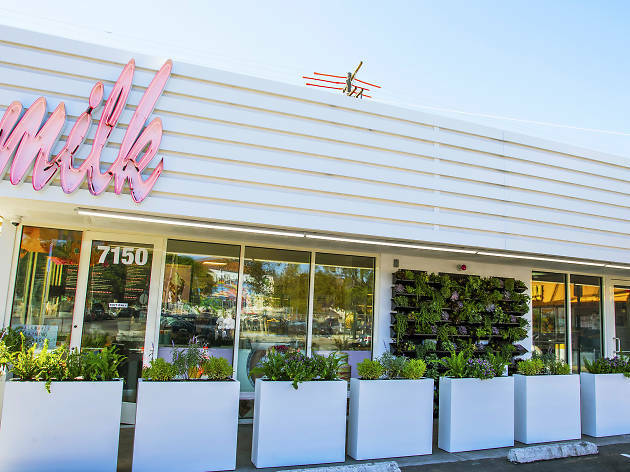 Most exciting of all might just be Milk Bar L.A.’s experimental “lab.” When a pink light near the kitchen goes off—or when a forthcoming neon sign out front lights up—Tosi’s crew will whip up new, whimsical desserts for customers to taste. If you’re not in the area, you can call 1-833-MILKLAB or follow @milkbarlab on Instagram to see if there’s an item coming out of the kitchen that day, and when to expect it. Take a peek below, then drop by to sample some sweets—including Saturday’s launch, complete with crafts, tastings and $1 cereal milk soft serve—for yourself. 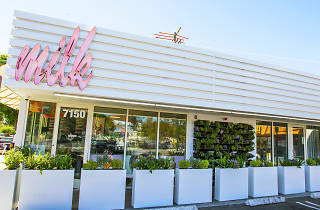 Milk Bar launches on Saturday, September 22, at 11am at 7150 Melrose Ave. Find it open from 11am to midnight on Sunday, Tuesday and Wednesday, and from 11am to 2am Thursday to Saturday. We caught her story on the Chef's Table series... normally not into sweets in such high volume but we were so intrigued by her story and her energy and her creativity that we just know we have to visit the new L.A. shop and try some of that crack pie.